September 3, 2014- The last first day of my high school career. 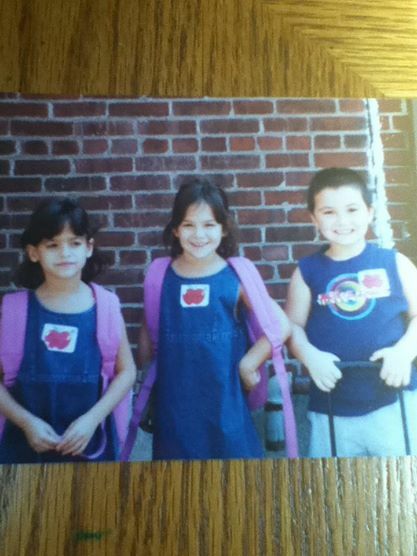 It seems like just yesterday when I was going to kindergarten with my twin, Kayleigh, and one of my best friends to this day, Joey. I remember vaguely learning how to write my name and learning about shapes. Where did the time go? My days were not spent worrying about which college I would be going to, instead things were much simpler. It was all about who had the nicer backpack and if my hair was in pigtails? It seems like I am forgetting the little things in life as I get older, which worries me. When I woke up this morning I did not feel nervous, instead I felt a sense of excitement. This had been the moment I have waited for all my life… One more year and then I will be studying my love, journalism. Today was not like any other first day however, I drove with my sister to school. Gone are the days where my mom would take my sister and I to school at 8. We were on our own. Going back to school and seeing everyone whether it was a teacher or a friend from previous years, made me nostalgic. I never knew how much I missed them. Everyone was happy to be back for the most part even though I am sure the excitement will fade in the coming weeks. Teachers were smiling, students were laughing and I was taking it all in. This year is different. My senior year will be filled with classes that I am interested in, not classes that I am forced to take. I have put a lot of thought into my future (probably too much) and cannot think of a better way to end my last year of high school. I am over the moon to finally have the opportunity to do what I want, in a way. Despite all of this freedom, it is still weird to me that I will be graduating in June. I have no idea what the future holds, but the only thing that is certain is that I am ready. I am ready to take on the world. I am prepared. I am confident. And I owe everything to my wonderful teachers. Good luck to everyone this year with school, study hard and enjoy it.